Are your employees constantly complaining about their chairs? Are you routinely guessing at what chairs to buy employees, using cost to drive your selection? Or perhaps you’ve experienced a high volume of seated work injuries? One major problem most workplaces fall prey to is there is no process in place or person to properly select and fit ergonomic chairs for their employees. Often, the person picking the chairs has little to no ergonomic knowledge or experience in what chairs are appropriate for their employees. As a result, the chairs selected wind up being inferior quality, don’t properly fit or simply don’t hold up well over time. On top of the poor selection, employees are unaware or poorly trained at chair fit and adjustment contributing to the onset of musculoskeletal discomfort. Figure 1. 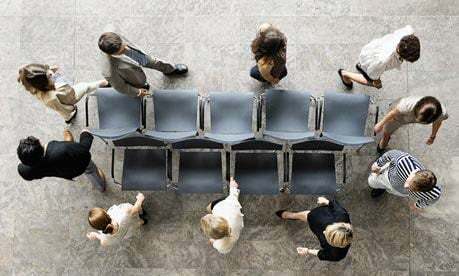 Are your employess routinely playing musical chairs because their chairs are just not right? To improve chair selection and fit accuracy, I’ve developed a method based on sitting preferences. I call it, “chair profiling”. We all have a sitting style and preference for what will work best for us based on the tasks we perform at our desks. Determining an individual’s “chair profile” results in improved chair selection and fit assuring much better employee chair satisfaction, efficient chair performance, and less likelihood of discomfort for years to come. So how does chair profiling work? It’s based on understanding how people work at their desks, desk design, stature and the chair features that will most often support them during task performance. In addition to employee height and weight, understanding an employee’s work tasks, sitting style and preferences is important in selecting and matching them to the most appropriate chair. 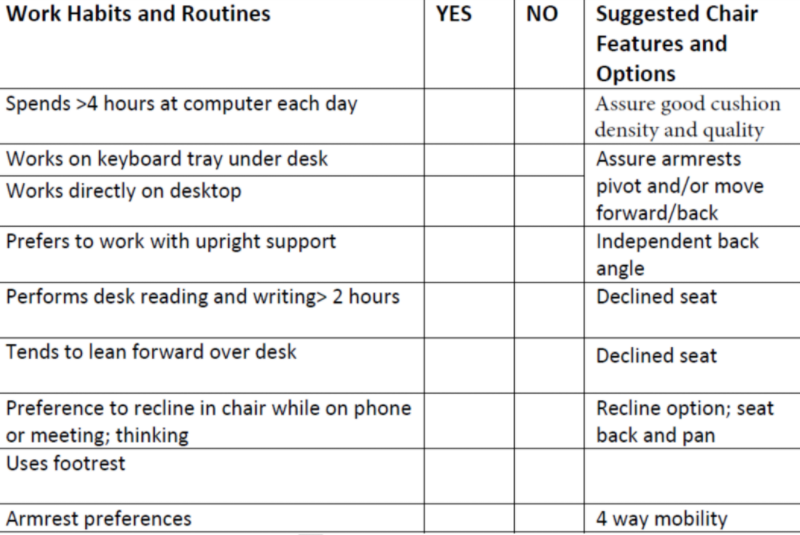 For example, in the table below, I identify a variety of work styles and associated chair features to include when specifying an ergonomic chair. Critical aspects of the workstation and work styles impact chair selection and performance. Consider the length of time sitting at the computer; whether the employee works directly on the desktop, the shape of the desk or whether a keyboard tray is used; whether employee perches to the front edge of the chair unsupported or prefers upright sitting; or performs desk work such as reading and writing tasks. Figure 2. The Worksite International Inc. chair profiling method helps to identify appropriate chair features and functions for best chair fit. Establishing a “chair profile” helps to improve selection accuracy. For example, a person who performs desk reading and writing on the desk and/or tends to lean forward over their desk may prefer a chair offering declined or forward tilt. Using our “chair profiling” method can help chair selection accuracy to identify an appropriate chair for one person or many people in the office. There is an art and science to chair selection and fit! If you are tired of “getting it wrong” or hearing employees complain about their chairs, then learn more about our DIY Train the Evaluator™ Ergonomics Workshop. You’ll learn about how to identify your chair standards and guide your employees through successful chair selection and fitting! In addition, we are offering a unique opportunity to help you become a Certified Chair Assessment Specialist (CASp) in your organization using the Worksite International Chair Assessment System (CAS). How Chair Aware is Your Ergonomics Program? If you can’t measure it, you can’t quantify it, therefore you are guessing! © 2019 Worksite International, Inc. All Rights Reserved.